"Virtual Horses" is an online horse betting game for real money. You place wagers on horses (each has their own odds), watch them race and hope that your bets come in. The obvious kicker is that everything is virtual. Virtual Horses swaps hay and crumpled betting slips for pixels and digits. Whilst you don’t get to experience the same excitement of a real-life race, the trade-off is that you can gamble whenever you like. So if you have an insatiable urge to bet on some horses at 2am, Virtual Horses is the answer. Fact: Virtual Horses plays exactly like Virtual Dogs. It’s actually made by the same developers, which explains a lot. It seems a bit lazy to create a whole "new" game by replacing one animal with another, and by that logic you’d think that the possibilities of real money racing games would be endless. However, seeing as the developers are obviously sticking to recreating actual real-life races, it looks as though "Virtual Pandas" and "Virtual Penguins" are off the cards for the time being. Virtual Horses fun rating - 78%. 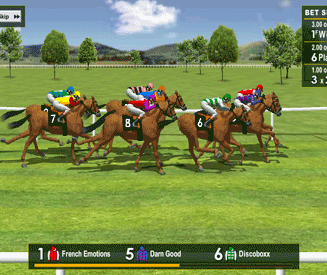 Virtual Horses is a fun game with an exciting race sequence. For a virtual horse racing game, I couldn’t ask for much more. Saying that, I actually prefer Virtual Dogs slightly more than Virtual Horses. 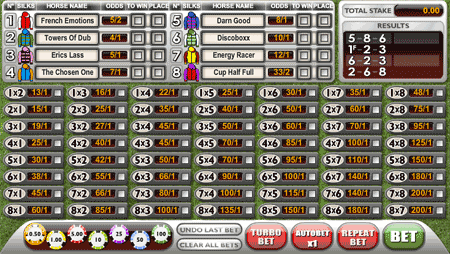 Virtual Dogs has slightly more betting options, and both the betting and racing windows have clearer designs. In Virtual Horses, the horses can get in the way of each other and it’s difficult to see whether or not your particular gee-gee is behind the leader or at the back of the pack. All in all though they’re virtually the same game, so I’m going to scrape a little of the rating off Virtual Dogs’ score and leave it at that. How to play Virtual Horses online. The basics of Virtual Horses. Place your bets on your favourite gee-gee. Watch ’em race, shout a little and hope that you’ve backed a winner. There’s no element of background knowledge or the ability to research the runners, but even though Virtual Horses is entirely luck-based it’s still a very exciting game nonetheless. Virtual Horses in more detail. There are 8 horses in every race, each with different, fixed odds. The favourite is 5/2 and the long shot is 33/2 (depending on which site you play at). The other 6 horses range from between these two extremes. After placing your bets and clicking "bet", the race sequence starts. The whole race takes about 30 seconds in total, but this can be skipped at any point by clicking "skip" or selecting "turbo bet" on the betting slip screen. Your bets for the current race can be found down the right-hand side of the window. After the race has finished the results are displayed at the bottom of the window. Winning bets are paid directly in to your account and you are taken back to the initial betting slip screen. Fact: The longest odds are 200/1. You can achieve this by betting on horses 7 & 8 (or vice versa) coming 1st and 2nd respectively. Virtual Horses betting options and payouts. There are two main options for betting in Virtual Horses. Bet on whichever horse you think will win the race. Bet on a horse that you think will either come 1st, 2nd or 3rd. This will have a reduced payout in comparison to betting on the straight winner. Bet on any two combinations of horses that will place exactly 1st and 2nd. Note: Payouts (and horse names) actually vary from one real money games site to another, although they all roughly hover around the same sort of odds. The betting slip screenshot above has been taken from the Paddy Power Games version. The second betting option of wagering on 1st and 2nd place horses tends to offer the biggest payouts. As with any other game, the less likely the outcome the bigger the payout will be when it comes in. The last eight results of the 1st, 2nd and 3rd place finishers can be found toward the top-right corner of the betting slip screen. Results from one race in Virtual Horses shouldn’t have any effect on another, but it’s handy to have the information there nonetheless.